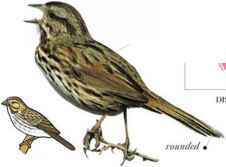 A heavily built bunting with a musical song, this bird feeds in undergrowth on insects and seeds. It sings from an exposed perch, even in winter. 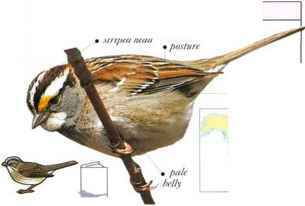 • NliST A cup nest, in a thicket, on the ground or in a shrub. 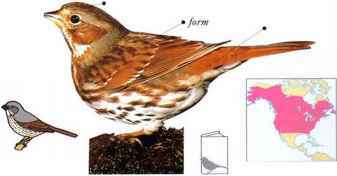 Identifiable by the loud, musical phrases of its song, this bird is common in open country with bushy cover and in thickets near streams. 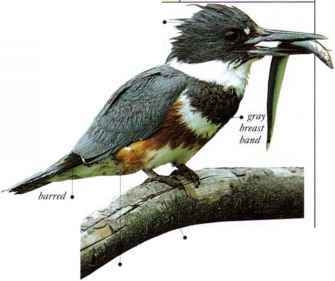 It feeds on the ground, taking seeds and invertebrates. • NEST A cup nest made of grass and stems, on the ground in a thicket, often near a stream. • DlSTKIB!ITION Breeds in North America from the Arctic Circle to Mexico. Some populations migrate south in winter.